I’ve been dying to make this dish. It’s such a great dish, perfect for those of you having cold weather and needing something that will warm you all the way through. So, I got tired of waiting for colder climate and made it anyway. We had a 13 F drop in temperature all the way from 88 F down to 75 F so we pretended we had a cold snap. I know it’s got chiles in it but these are poblano chiles and you will like it. I promise. Looking at the title of this post you will immediately see this soup has no fish in it so how can it be a chowder, right? Well, what is a chowder anyway? Typically, chowder is a rich, creamy soup (although Manhattan clam chowder is based upon tomato, not cream), historically considered a “poor man’s soup.” It’s thick and full of all kinds of ingredients making it similar to a stew. Traditionally, chowders were seafood based with seafood, vegetables and cream. Many trace the word “chowder” back to the fishing villages along the coast of France from Bordeaux to Brittany through the word “chaudiere.” Chaudiere comes from the word calderia which meant cooking pot and also gave the world the word cauldron. They story goes that when the ships returned from the sea, every village had a large chaudiere waiting for a portion of each man’s catch. The catch was thrown in the community chaudiere to be cooked and served later as part of the community’s welcoming celebration. This explains the reason why traditional chowders are seafood based. 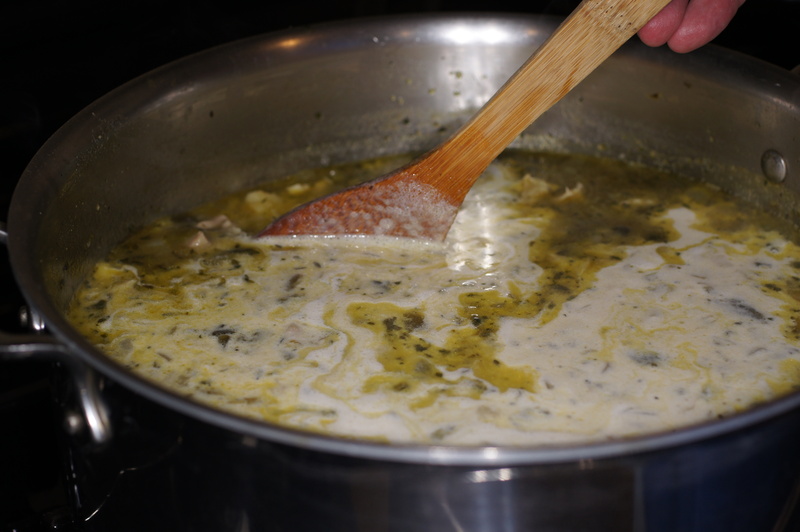 Over time, however, the technique expanded so that today chowder now includes all kinds of different flavors and textures, like this chicken poblano chowder. In this recipe, the focal point or star of the show is the roasted poblano chile. The ancillary ingredients are the chicken, potatoes, onions, cream, tortilla strips and goat cheese. You could also include fresh kernel corn and carrots, if you desired, but it would make it sweeter in flavor. 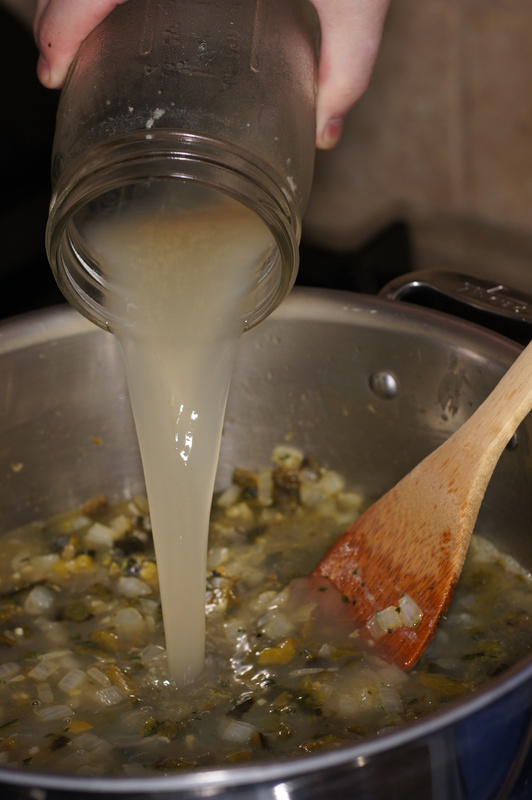 The cooking liquid is homemade chicken stock and it is thickened with the use of potatoes. 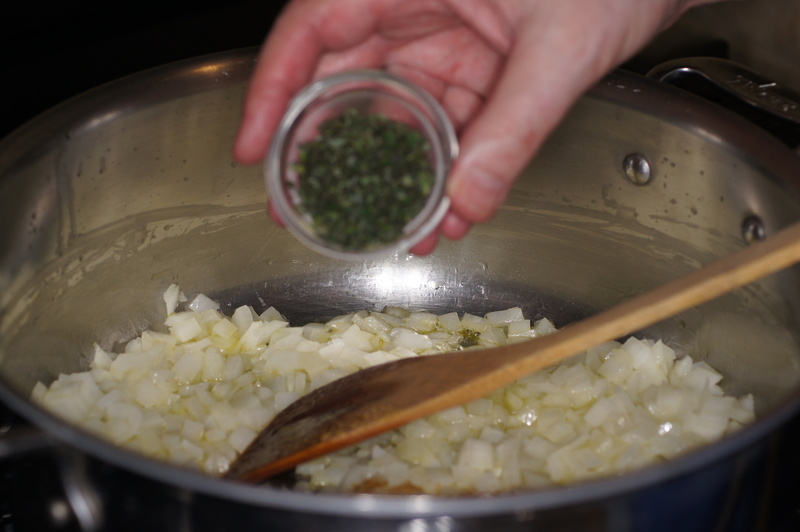 The seasonings are salt, fresh thyme, fresh oregano, powdered cumin and powdered coriander. The net result is a heart warming soup, full of flavor. You get the wonderful flavor of the roasted poblano coupled with the sweetness of the chicken, a little bite of the onions, the smokiness of the cumin and poblanos, the floral essence of the coriander, oregano and thyme, the luscious smoothness of the cream, the crunchiness of the fried tortilla strips and that creamy, tangy bite of the goat cheese. 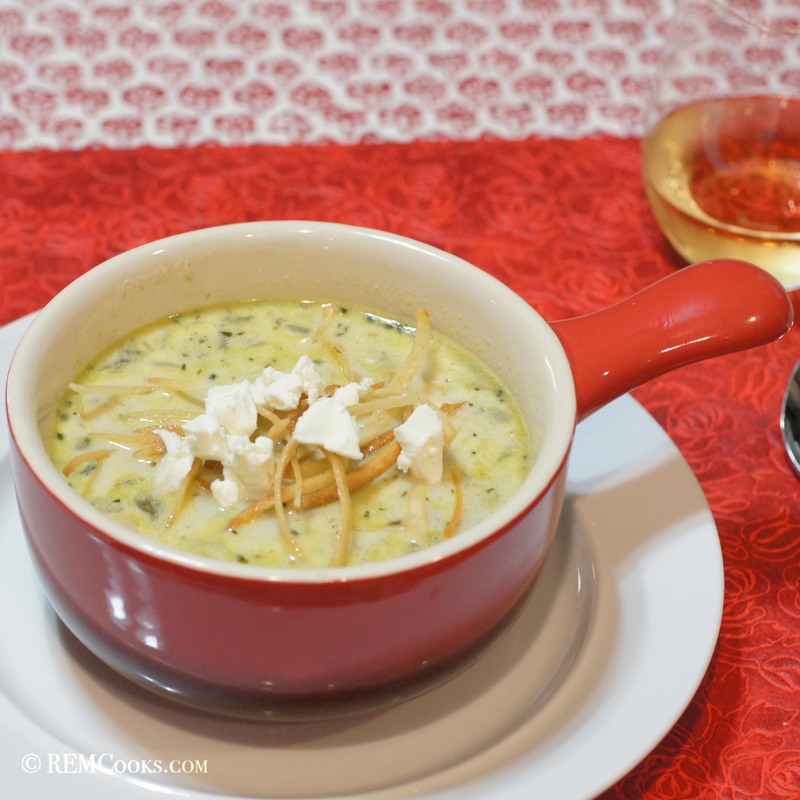 On a cold day, this soup will flat out warm your soul and all will be good with the world. 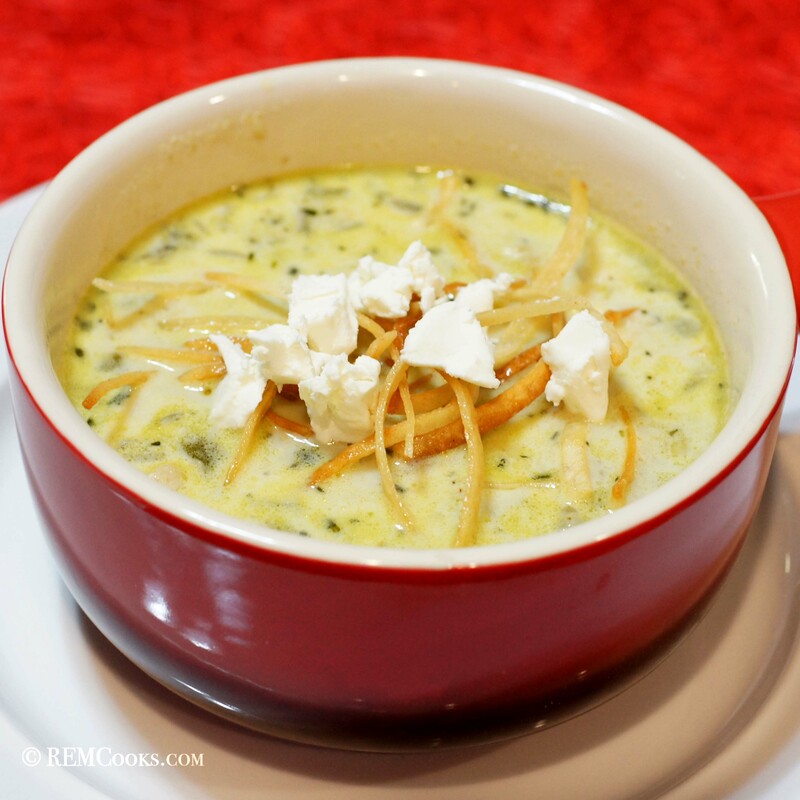 Put this dish in your recipe book for one of those upcoming cold, blustery days when only a heart warming soup will do. Of course, you don’t have to wait until it’s cold. It can be 75 F and it’s still a very satisfying meal. 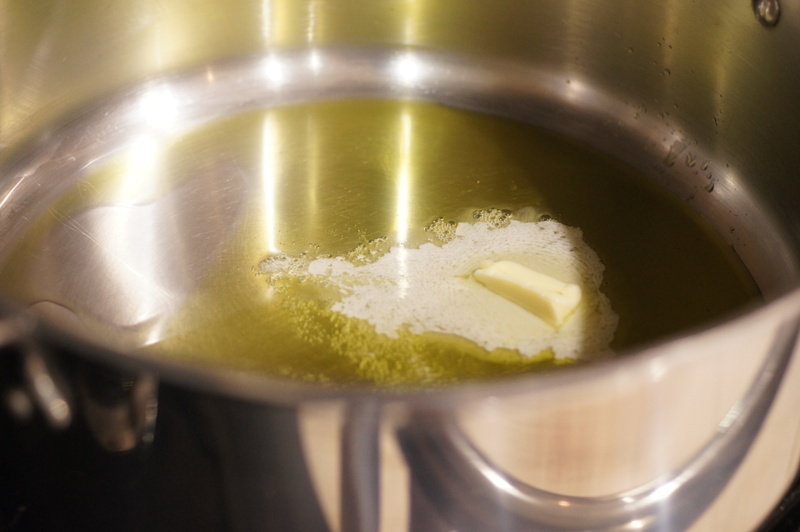 Add olive oil and butter to a large pot over medium-high heat. 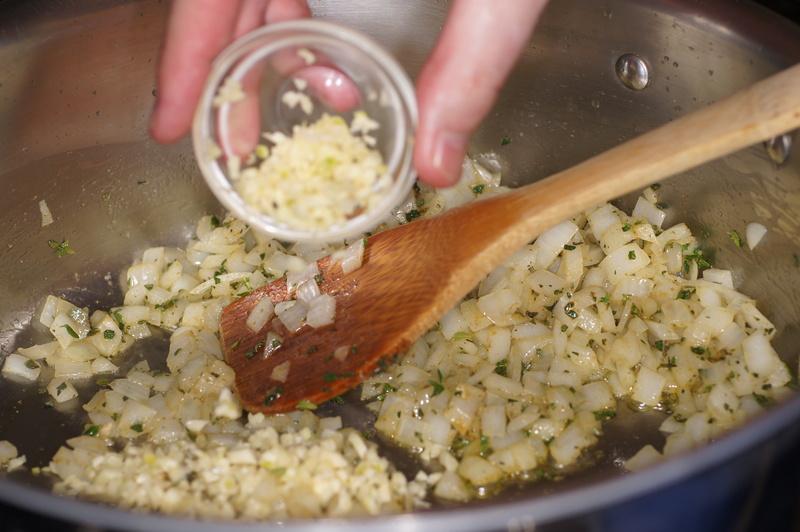 Add the onions and sauté for 3 minutes. 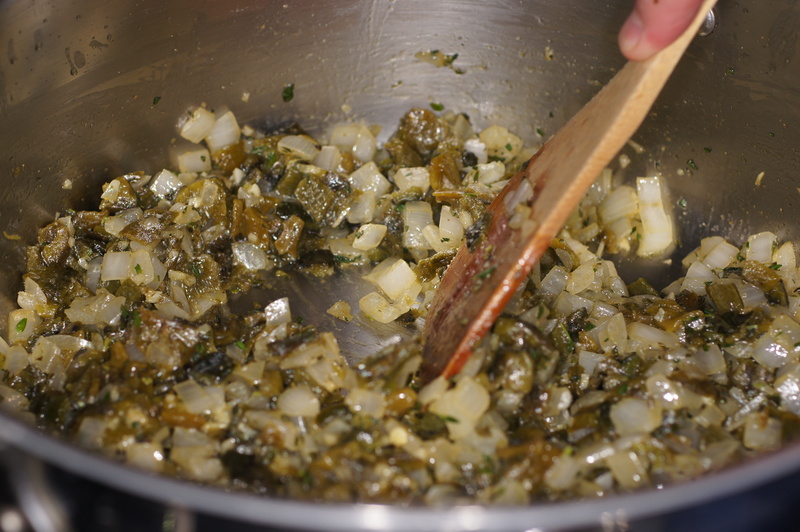 Bring to a boil, then reduce to a simmer and cook for 15 minutes. Now, add the potatoes. 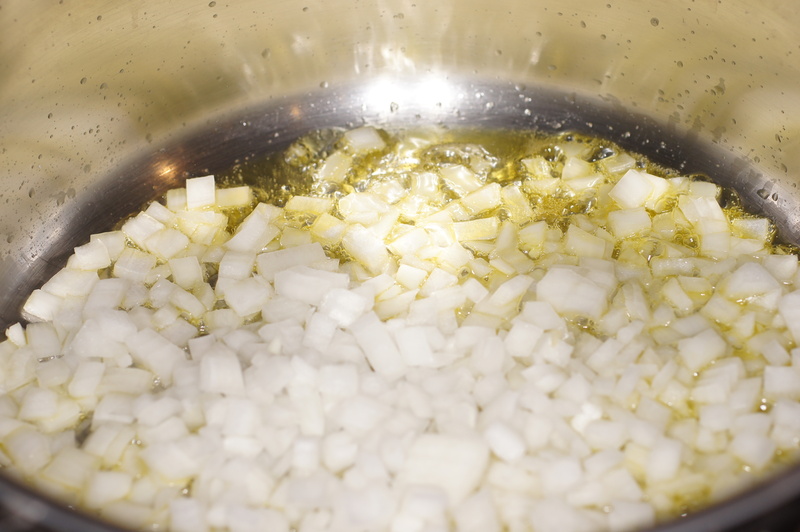 Add 1/2 Tbsp salt, return to a boil and cook for an additional 20 minutes or until the potatoes are cooked through. 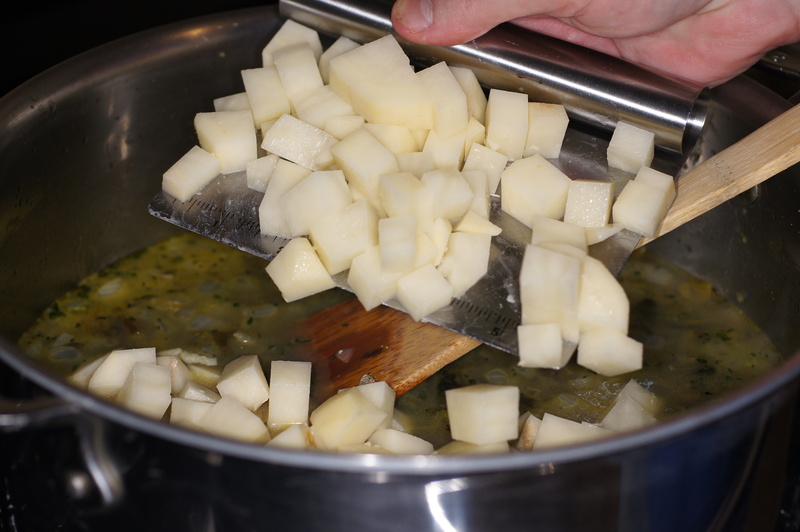 Now, using the back of a wooden spoon, smash some of the potatoes to thicken the chowder. Add the chicken. 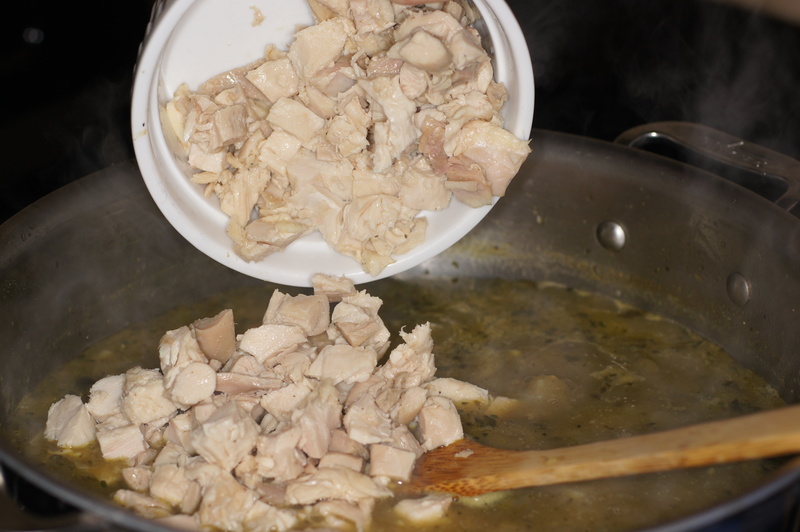 Return to a simmer and cook another 3 to 5 minutes to heat the chicken through. Now, add the cream. Taste and adjust salt, as needed. I found roughly 4 tsp of sea salt total was what it needed but I use completely unsalted, homemade chicken stock. If you use bullion cubes, you probably won’t need any salt, low salt canned broth will need some salt but not as much as what I required. Also, everyone’s taste is different. 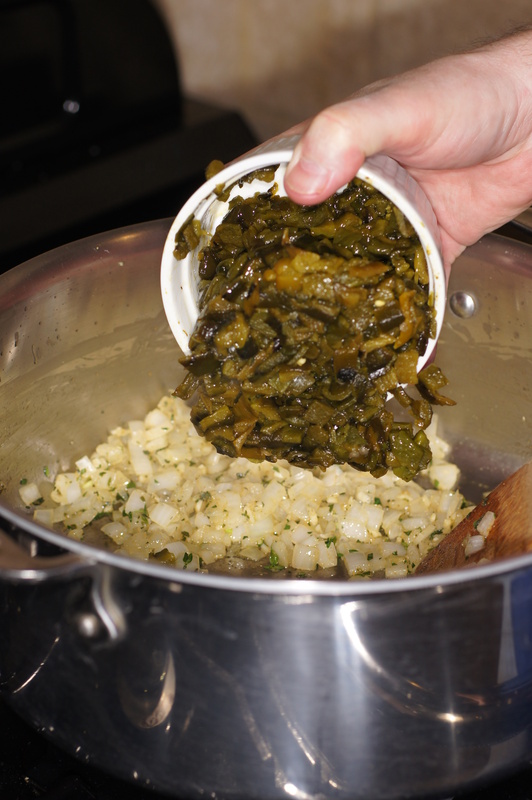 While the chowder is cooking, add 1/4 cup of oil/lard to a cast iron skillet over high heat. 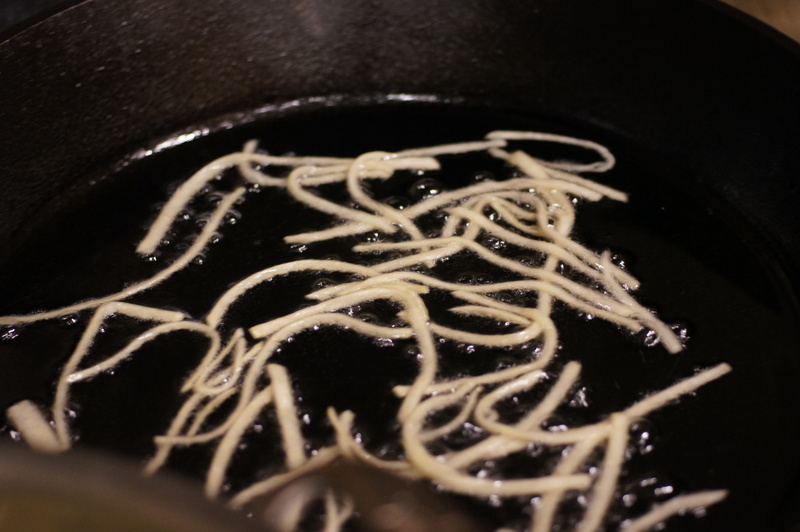 Fry the tortilla strips in batches. 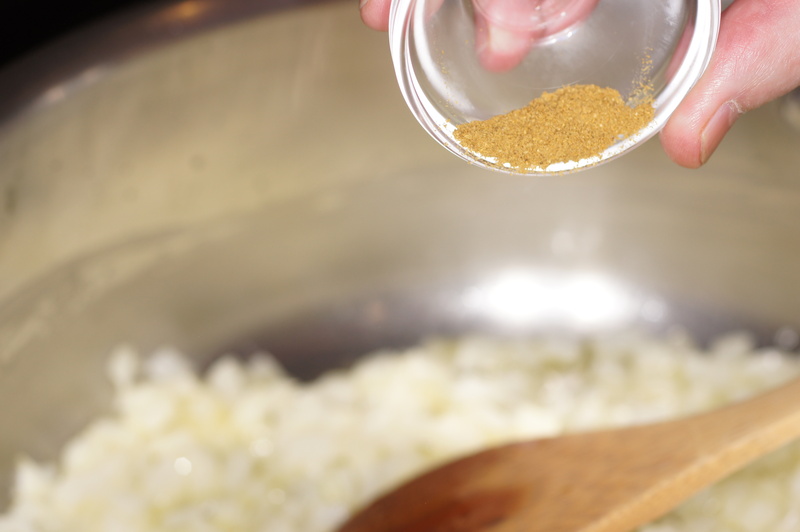 When done, remove from the oil and place on a rock to drain. Set aside for service. Ladle some chowder into a deep bowl. Place the tortilla strips on top of the chowder. Crumble some goat cheese over the top. Serve & enjoy! Richard, LOVE this! Going to make soup this week. . this looks amazing!!!! Thanks. 🙂 We really enjoyed it last night. We served it with some flour tortillas, although some nice buttermilk biscuits would go exceptionally well with this, too. Love the chowder etymology! Liked poblano peppers when I was in the US, can’t make this here 😦 Looks great though! Interesting on the history of the word chowder. Or chowdah in NE. 🙂 Though as my husband doesn’t like seafood, this is a chowder he could get down. Looks amazing. Love a good soup & chowder and those crispy strips are outta this world! That something that seems so everyday like a tortilla can really lift this dish is fantastic, and the obligatory cheese makes me drool. As we’re heading into summer I’m slowly saying goodbye to those comfort foods, but no doubt I’ll return soon! I so love a good clam or corn chowder, Richard, but that doesn’t mean that I wouldn’t enjoy this one.I bet the goat cheese topping is a great addition, especially once it starts to soften a bit. Yum! Lovely. The tortilla strips are a nice touch. We have the weather for it right now! I love chowders. Having family from New England, we normally stick to traditional seafood or corn chowders though. This sounds like a nice variation. Thank you Richard, I will be making this soon, looks delicious!